Maroon = flash flood warnings. The greens are flood warnings. This situation is going to get much worse before it gets better. 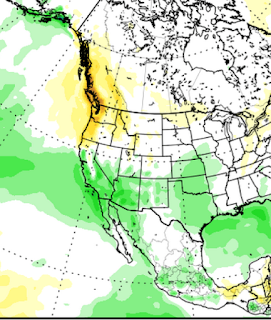 People have been wondering where, given the El Nino, the rains are for Southern California. 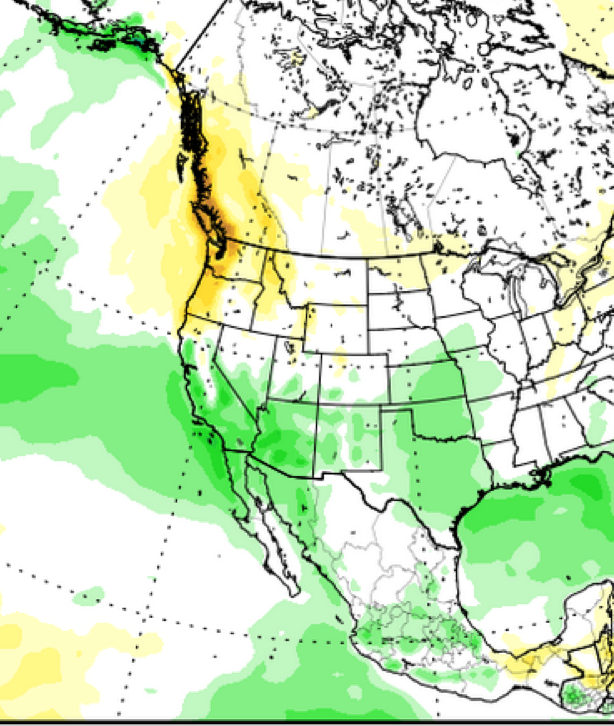 Looks like with the latest pattern change, they will start in early to mid-January. The above chart (h/t AccuWeather) shows the difference in rainfall compared to normal and it covers the second week of January. With the first really cold air mass of the season in the eastern part of the nation, please make sure your garden hose is disconnected. Otherwise, it could cause a pipe to burst. The last of my least favorite winter storm ever is winding down in the Upper Midwest. You can expect some possible delays if you are traveling through Minneapolis today. The great area is where flood warnings continue in effect. Also in effect is our perpetual advice: Turn around, don't drown!! Information from the medical examiner in Garland, Texas: All eight fatalities in that city were people in their automobiles. 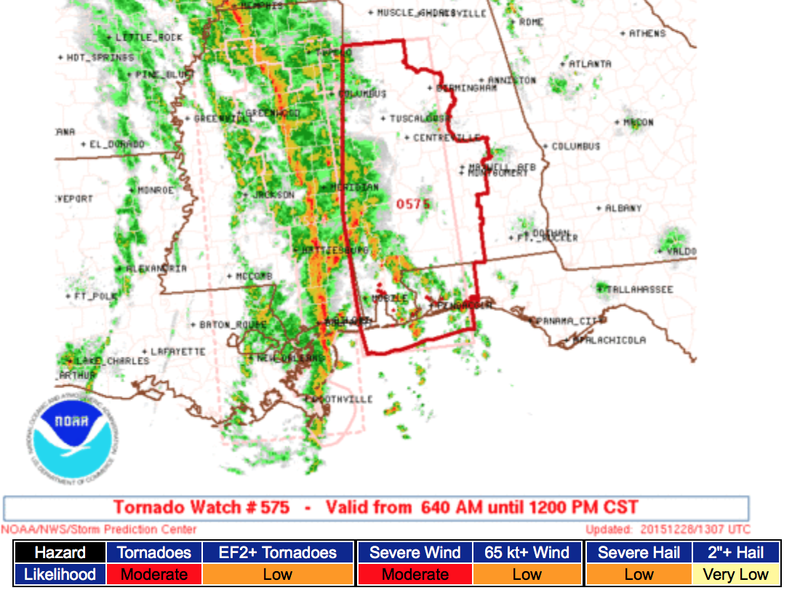 During a tornado threat, I recommend listening to a trusted local radio station and having an app that tracks your location and gives you warnings. 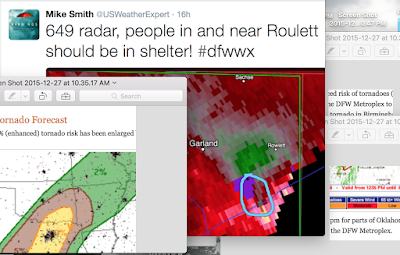 If you are driving, find a substantial public building and take shelter inside. We are at the dinner hour in the Central time zone when people are making decisions for the next day. So, here is my final winter storm update for the evening. Interstate 40 is now closed from Albuquerque to Texola, in western Oklahoma, a distance of 400 miles due to the blizzard and the ice. 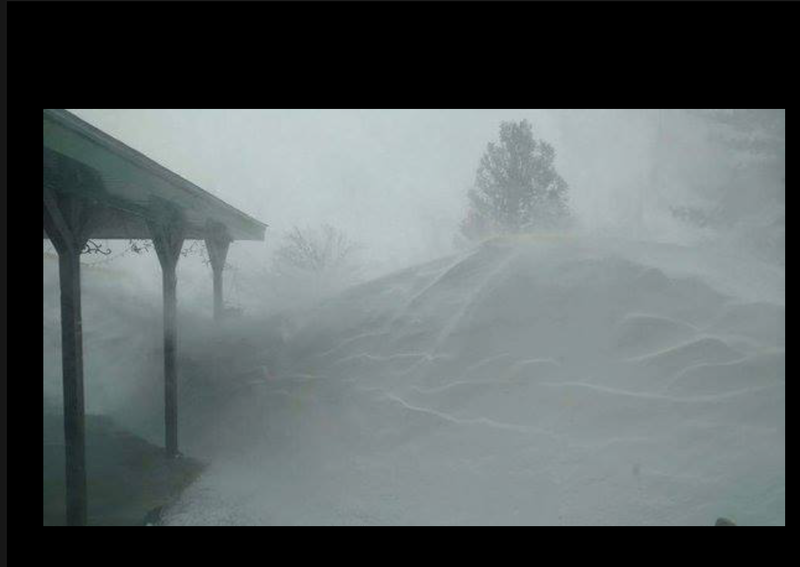 Via Facebook, this is what it was like to live in the blizzard area. Gov. 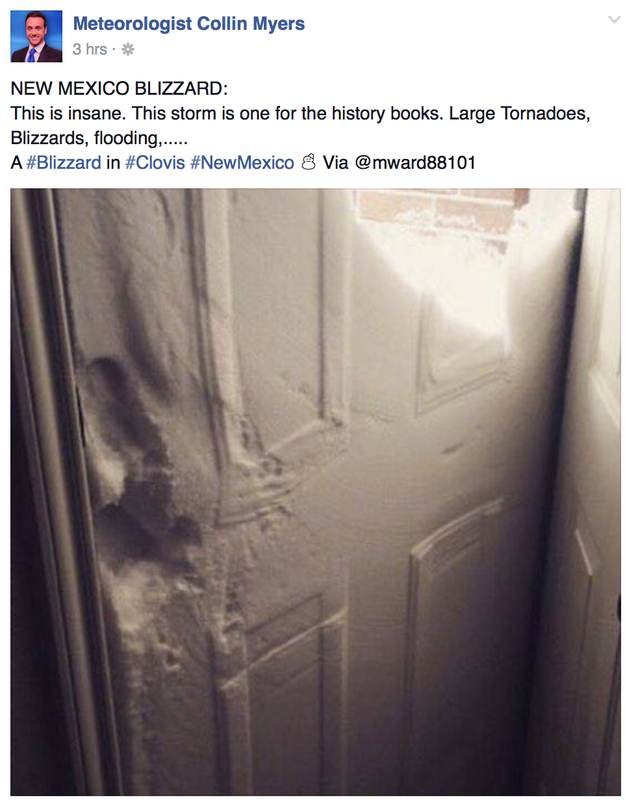 Martinez has declared a State of Emergency in New Mexico. 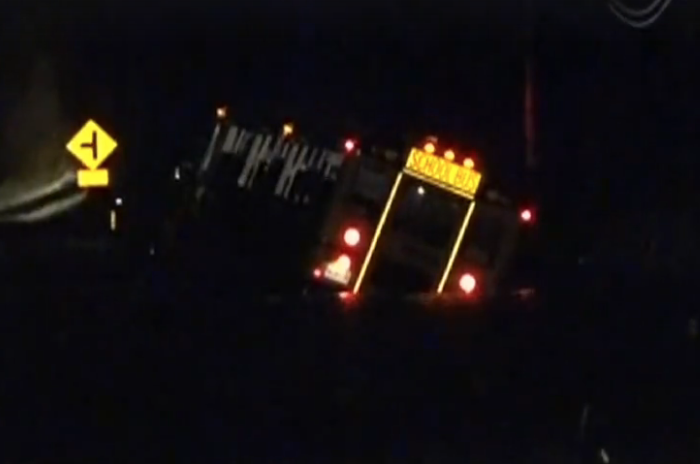 The last I heard I-70 is closed just west of St. Louis and I-49 is closed in southwest Missouri due to flooding. Addition 6:15pm, Gov. Nixon has declared a State of Emergency in all of Missouri. 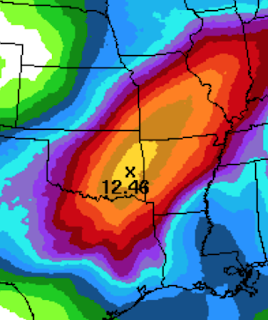 Another 2-4 inches of rain will fall from now to 4pm tomorrow from southwest Missouri to southeast Oklahoma. There are tornadoes in progress as I type this, please scroll down for the current tornado watch. I am not live-blogging those storms. Forecast radar for 10pm. 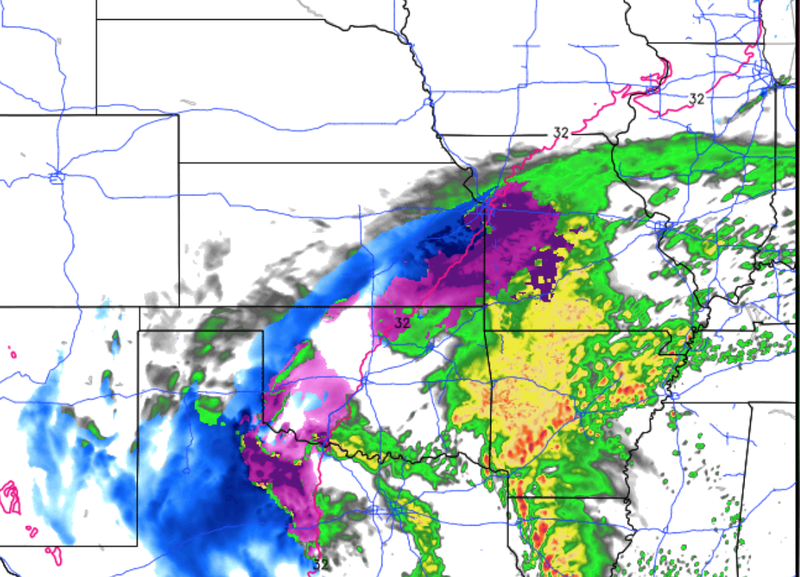 Blue is snow and purple is freezing rain or sleet. Here is the forecast radar for 7am Monday. Here is the forecast snow from now until 7am (more snow will fall after that time). There will considerable blowing and drifting of the snow. The light blue is 2 inches. The break at dark violet is 7 inches. The area in the southeast Texas Panhandle is forecast to receive nearly a foot. 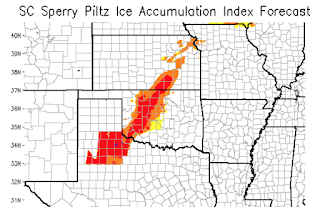 There are already 52,000 homes and businesses without power in Oklahoma due to the ice storm. Addition 6:12pm: 1,500 homes around Rose Hill, Kansas, are now without power. Rose Hill is about 25 mi. 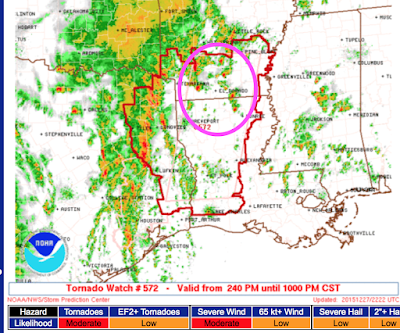 ESE of Wichita in the pink area below. 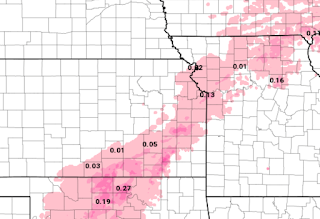 The amounts of ice being forecast vary widely this evening. I lean toward the low side of the forecasts. However, the already gusty winds in Kansas and Missouri will increase a bit during the night. So, because of uneven ice loading on power lines there is still the potential for power failures. This is reflected in the Sperry-Piltz power failure index which reflects temperatures, amount of ice and winds. 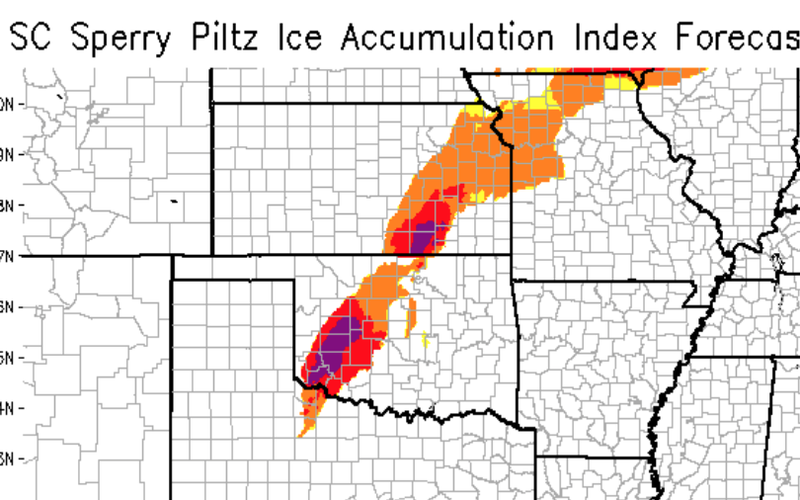 You can see on the forecast for additional freezing rain accumulation that the greatest amounts are from the southern Flint Hills in Kansas (east of Wichita) into north central Oklahoma. This is reflected in the Index by the red areas which have a chance for scattered additional power failures. 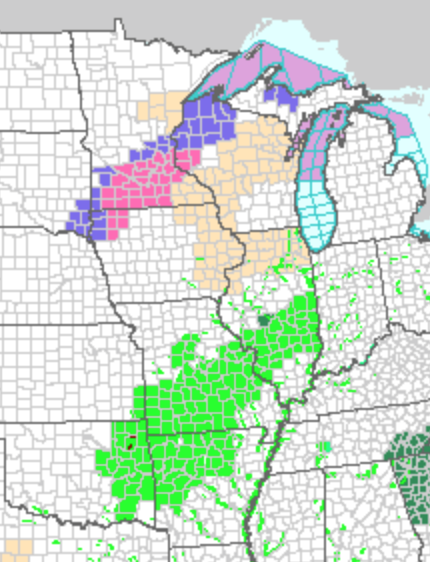 There is a lesser, but certainly not zero, chance in the orange and yellow areas. There is a cluster of thunderstorms either producing tornadoes or are potentially tornado producers (circled). 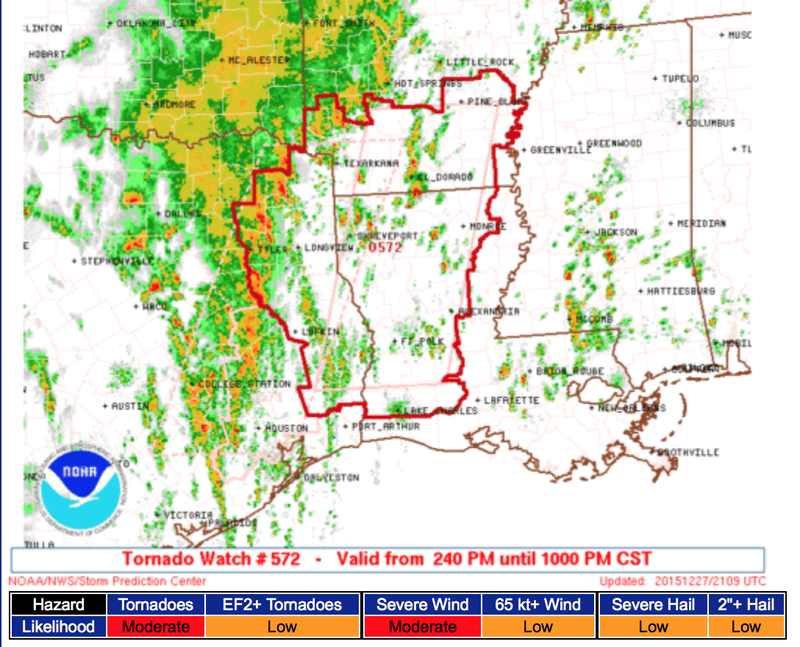 Tornado watch for the entire area. Unfortunately, the tornado threat continues and a new tornado watch has been issued for this region until 8pm. Please monitor reliable local sources for warnings. Note: I am not live-blogging the storms. Here is the AccuWeather Regional Radar at 11:50am. 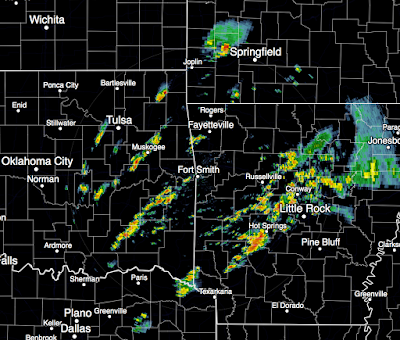 The heavy rains continue from the Ozarks to northeast Texas. 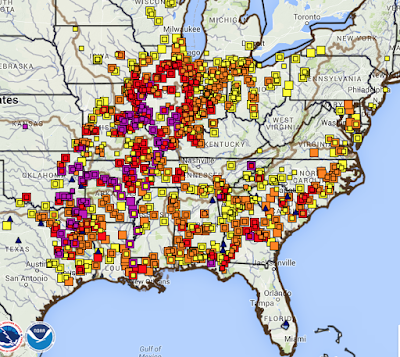 Severe flooding is reported in some areas and extreme caution should be used if traveling. I would not even attempt to travel in that area tonight. The extreme winds (gusts to 62 mph!) at Altus, Oklahoma, have caused the reservoir water pumping station to lose power and the water supply is severely limited. Power is out in a number of areas in western Oklahoma. 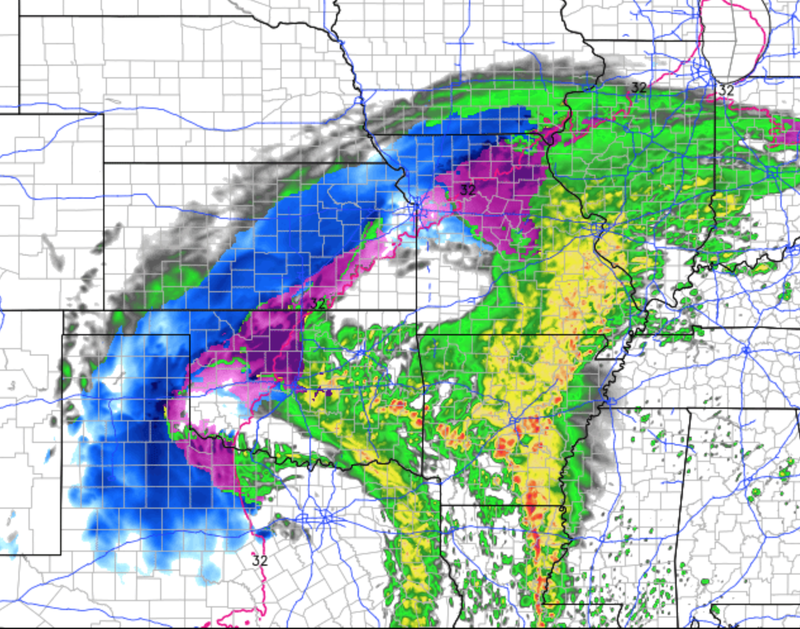 Here is a forecast radar for midnight tonight. The storm finally gets organized. Other than in northwest Kansas, I would discourage travel tonight in Kansas and Oklahoma due to ice, snow, flooding and high winds. 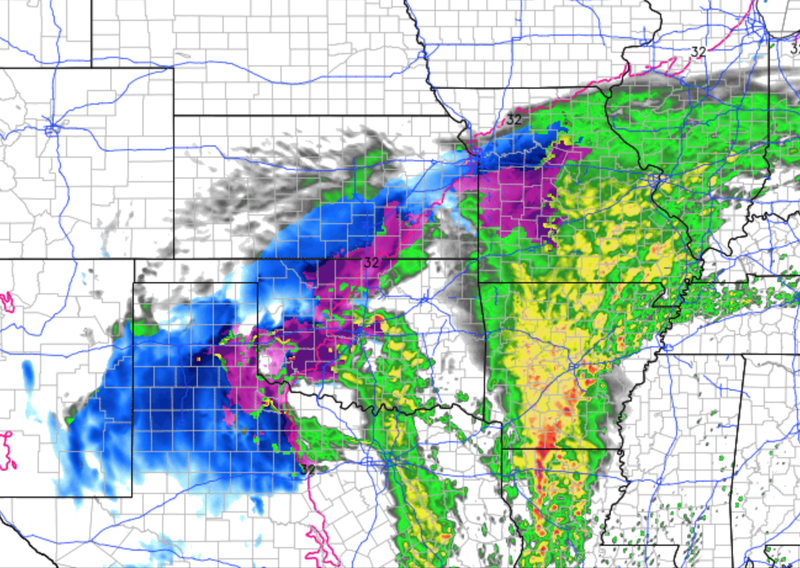 Blizzard conditions are possible tonight from central Kansas to southwest Oklahoma. ADDITION at 1:20pm. New Mexico's Gov. Martinez has declared a "state of emergency" due to the blizzard. 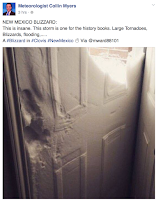 She says there are eight foot drifts and people stranded by the storm. 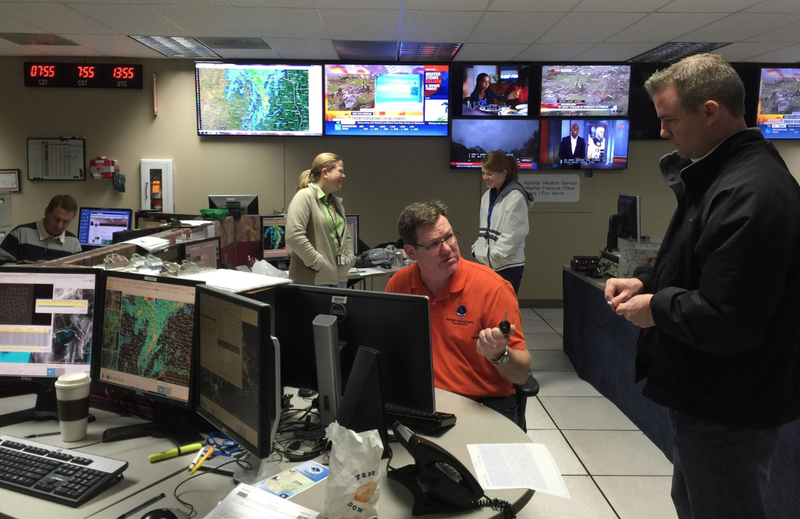 This photo is from the NWS office in Ft. Worth before they began their terribly grim job of surveying the numerous tornado tracks in the east part of the Metroplex and in northeast Texas. Those of us who have performed those surveys know it is extremely difficult work and you see things you wish you could forget you have seen. 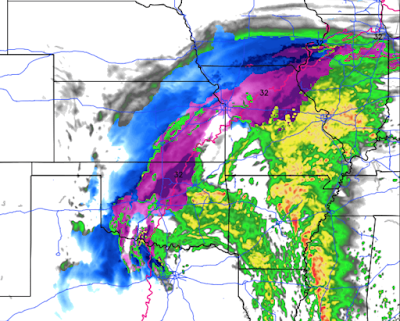 Meteorologists have had an incredibly stressful Christmas week. Up until Wednesday, only ten people had lost their lives in tornadoes in 2015. 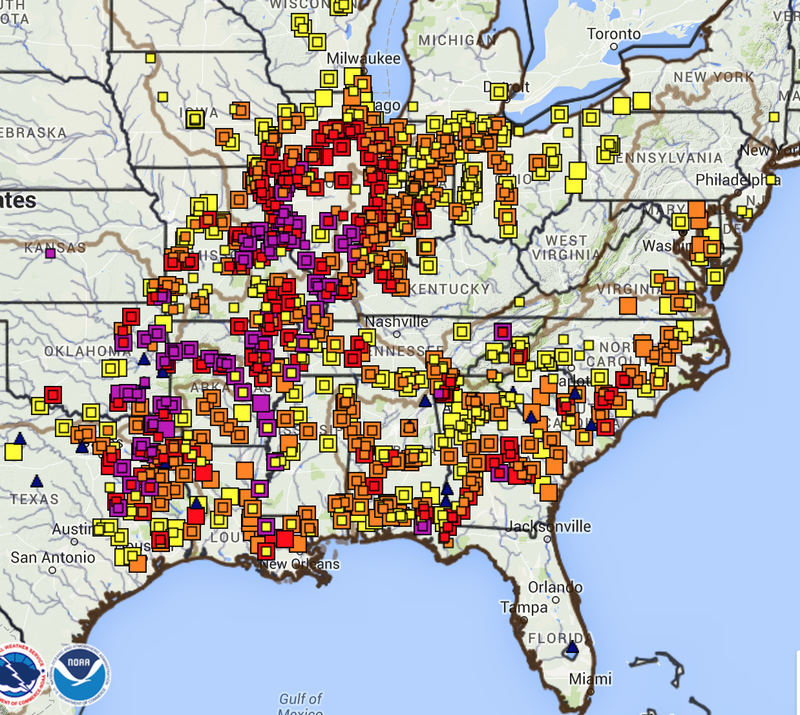 Below are the tornado, severe thunderstorm and flash flood warnings since. 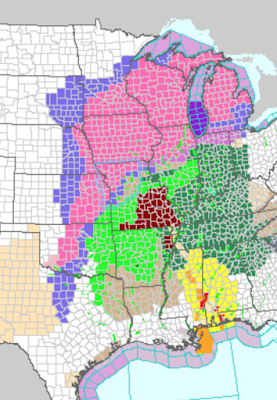 It does not include winter storm warnings. 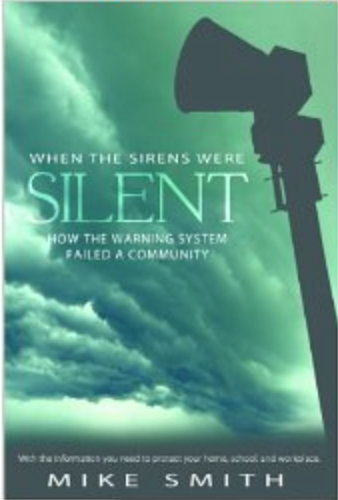 Since Wednesday, the death toll it is at least 28 in spite of excellent warnings. Dallas (see below) was being singled out as threatened more than ten hours before the tornadoes occurred. My spell checker kept changing Rowlett to roulette. 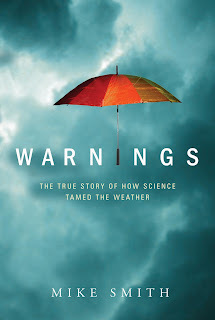 In my haste to get the warnings out, I sometimes didn't get the entire word changed. It is likely the death toll was low given nighttime tornadoes but we won't know what until the surveys are completed and the experts have reviewed the results. Regardless, the winter storm plus day after day of major tornadoes during the holidays stress meteorologists. 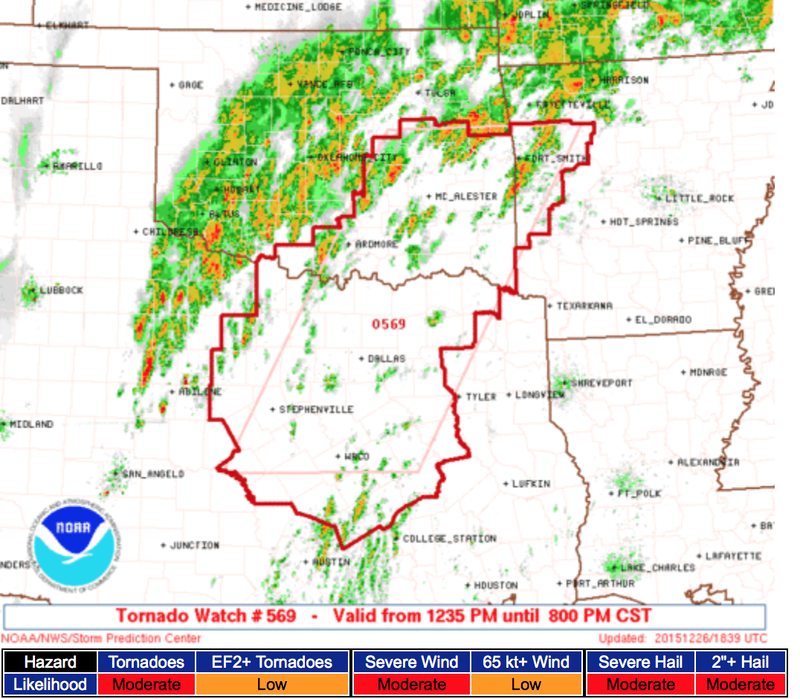 If you know a meteorologist in the central United States, please give him or her a pat on the back! 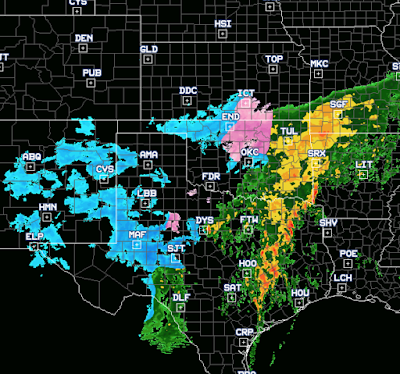 Severe icing is reported on I-40 in western Oklahoma. Here is the forecast radar for this evening. 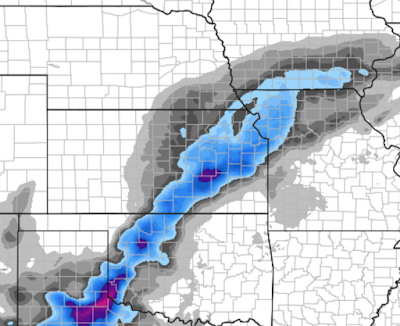 And, here is the forecast for additional snow accumulation. The blue = 2 inches. The dark blue is 4 inches. Pink is six inches. Don't take the point amounts literally. 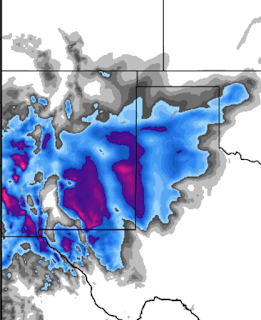 This is meant to show the general pattern of additional accumulations. Dalhart, Texas, is currently reporting wind gusts to 55 mph. Here in Wichita, the winds are gusting to 40 mph. 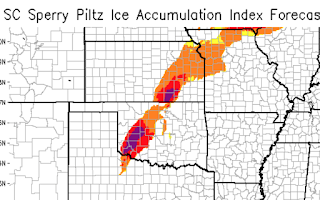 These high winds will make any ice accumulation more likely to cause power failures. The areas with darker colors are areas where power failures are more likely. 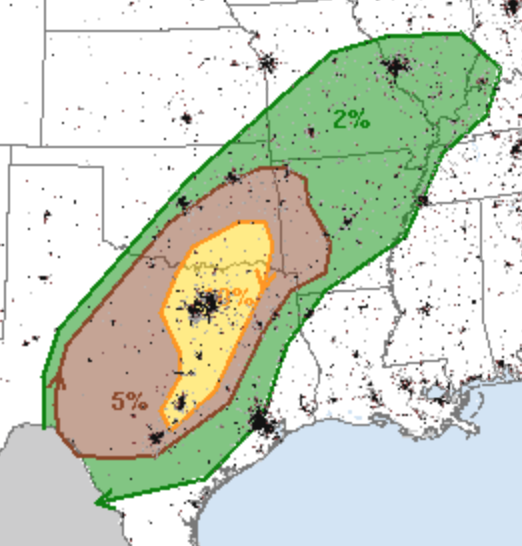 After the major tornado damage in the DFW Metroplex area, they do not have to worry about a tornado the rest of the night. 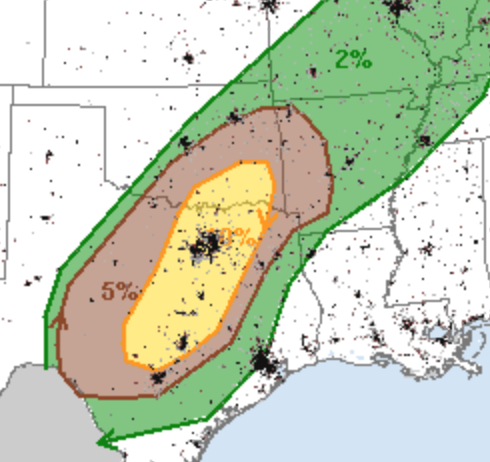 I am concerned there is a slight chance of a tornado after midnight in the Texas Hill Country, including Austin and San Antonio. 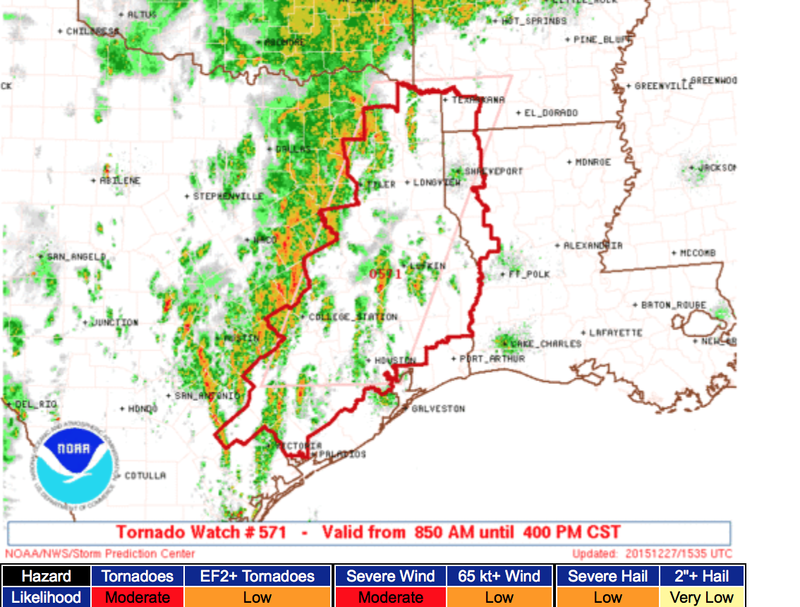 Below is the forecast radar for 2am CST. 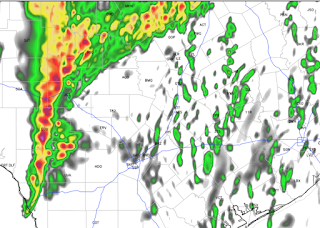 Here is the forecast radar for 8am Sunday. There will be a break in the precipitation in Kansas and the northwest Panhandles area due to some dry air. The "L" in southern New Mexico is the low in the upper atmosphere. 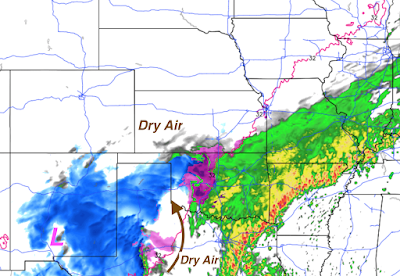 As the low moves ENE and then NE, the dry air will be overcome and the precipitation will resume in the central Plains. Regardless, note the freezing rain in western Oklahoma. 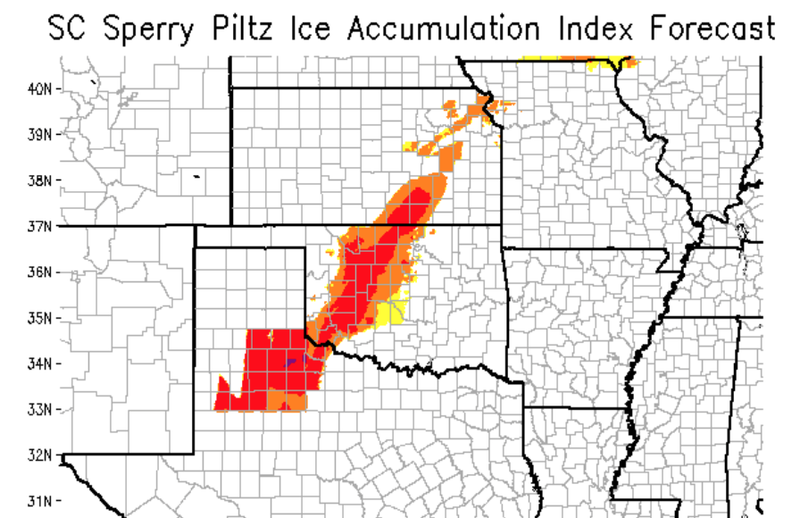 There is a high likelihood of power failures in Oklahoma due to the high winds and ice accumulation. There are unconfirmed reports of deaths and confirmed reports of the Rowlett, Texas, hospital turning away people because it is over capacity. 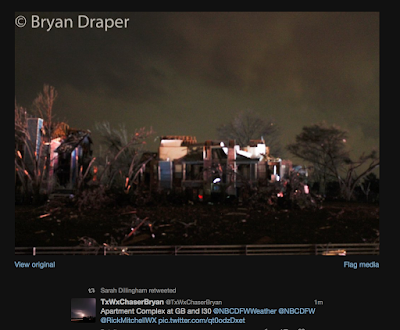 I must turn my attention back to the winter storm and have ceased my live Twitter coverage of the Texas tornadoes. 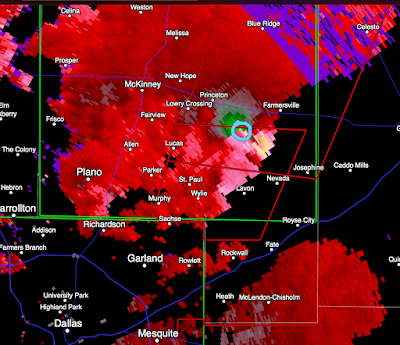 Here is the tornado location at 7:15pm. 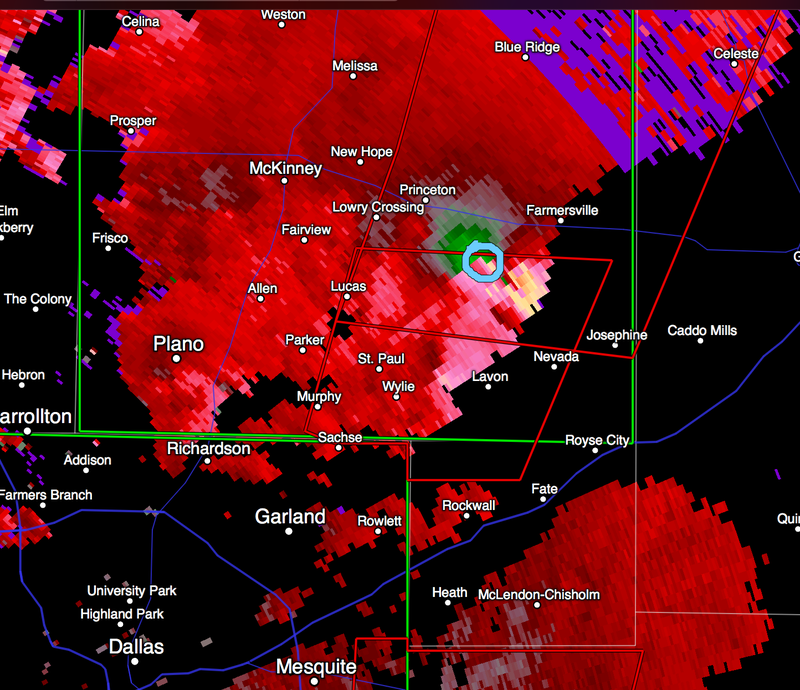 It is between Farmersville and Princeton at 7:20p moving NNE. 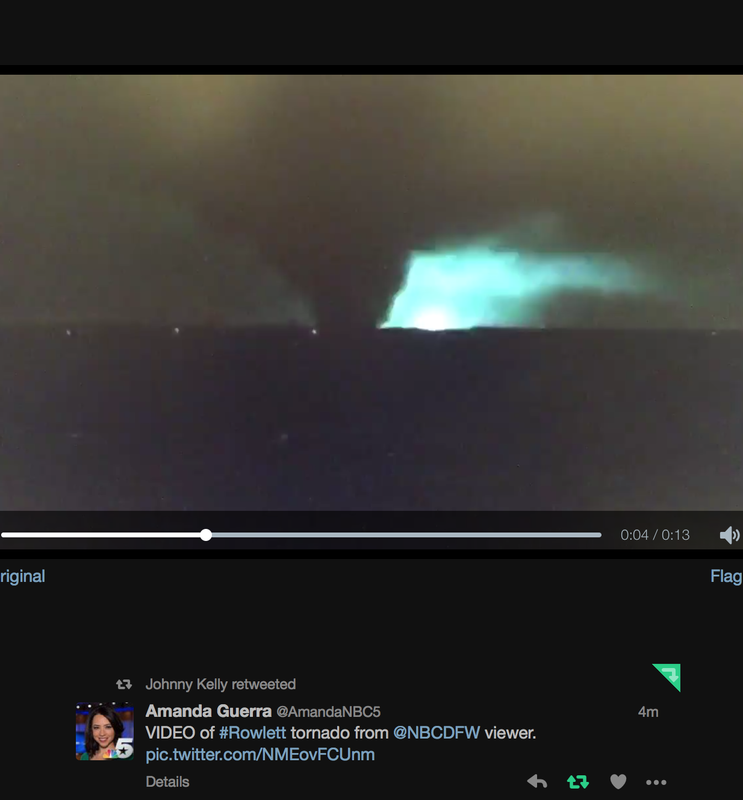 It is, reportedly, a "large" tornado. 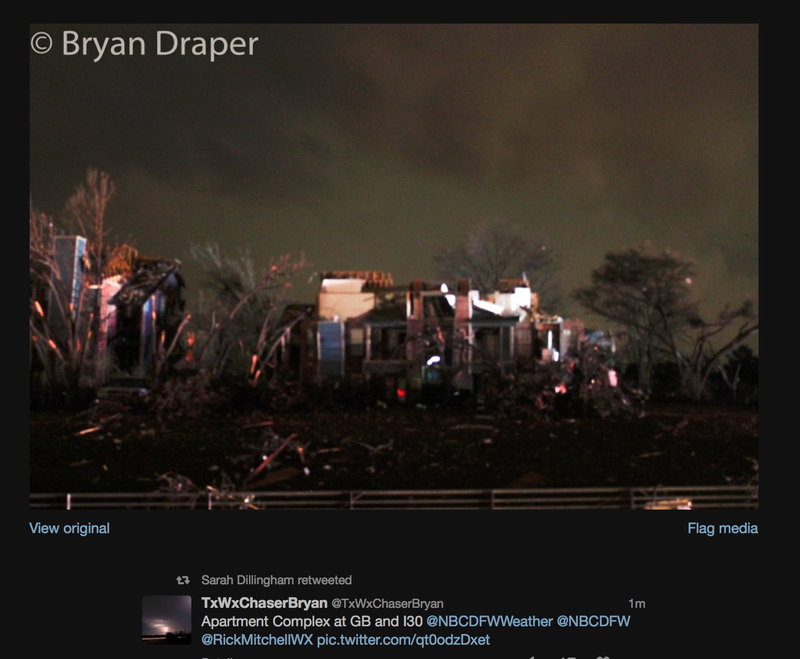 I am covering it in real time @usweatherexpert on Twitter. 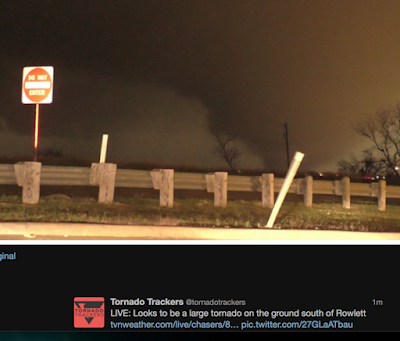 This is what the tornado looked like at 7:53p, via Twitter. Also via Twitter, the tornado when it was near Rowlet. 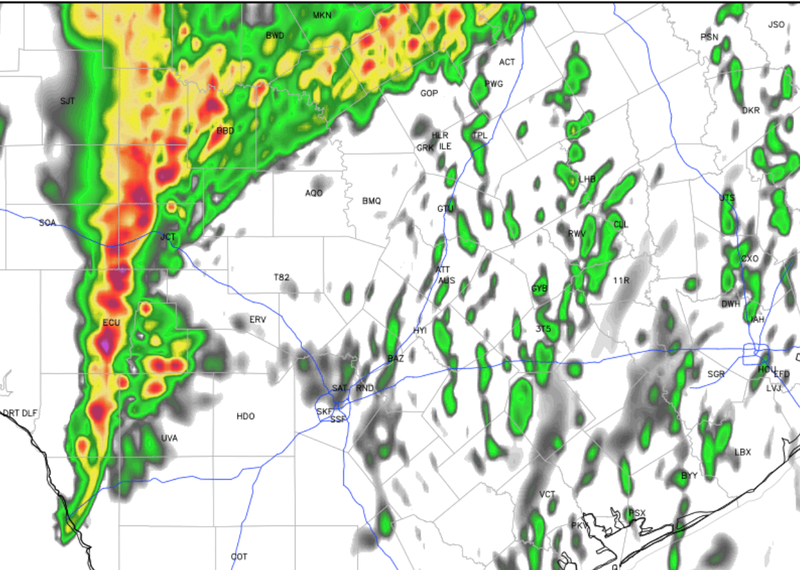 Here is the forecast radar for 4am Sunday. 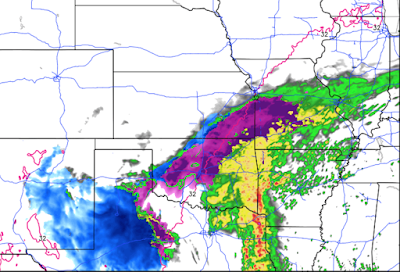 The purple is freezing rain and sleet. 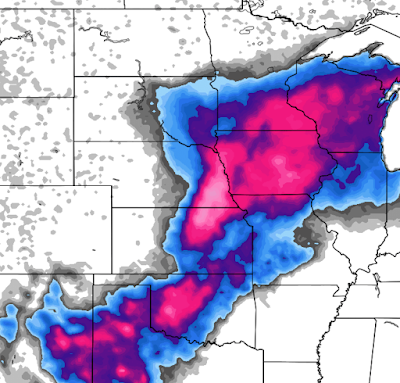 The pink areas are forecast to have more than six inches at that time. Here is a recap of the weather situation for this storm. Things have not changed significantly since my last posting. 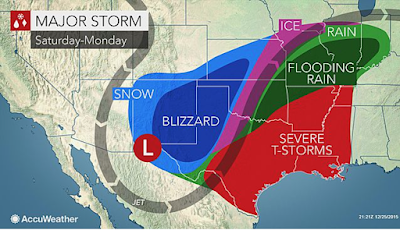 AccuWeather has details here. 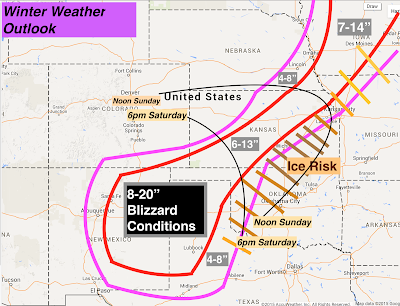 As indicated above, there is the potential for enough ice and wind for power failures. The darker the color, the more likely, and lengthier, the power failure potential. I would have preferred to keep the 10,000 blog posting at the top of the blog all day but Mother Nature dictates otherwise. 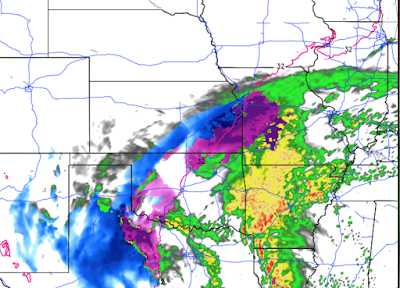 We have a potentially dangerous weather pattern in progress. Brown is the significant threshold as far northeast at Fayetteville with an enhanced risk of tornadoes (yellow) from southeast Oklahoma through the DFW Metroplex to Waco and Austin. There was a damaging tornado in Birmingham yesterday and this airmass will spin up tornadoes even though it is the very end of the year. There is also a very dangerous flooding threat, especially given post-holiday traffic. 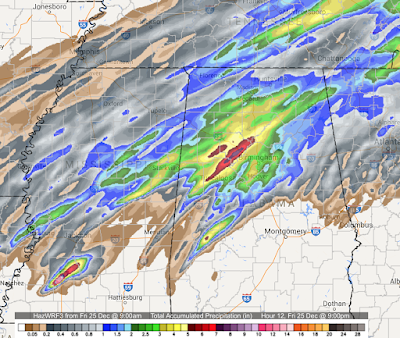 This map shows the rainfall from now through Monday night. River flooding will continue for several days after the rains cease. 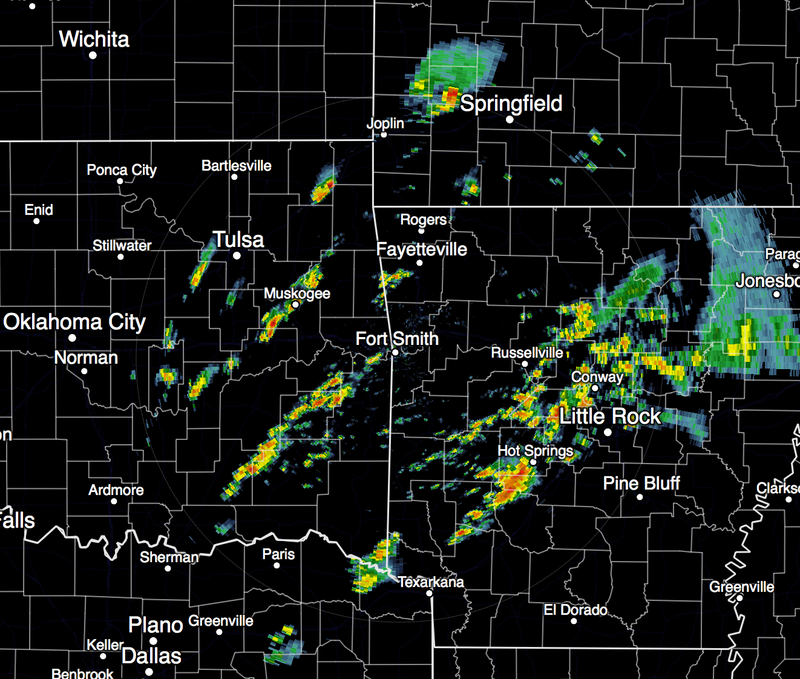 The latest radar reveals the rains have started in that region. If you have to travel through this area today, slow down. Roads will have ponding and will be hazardous. 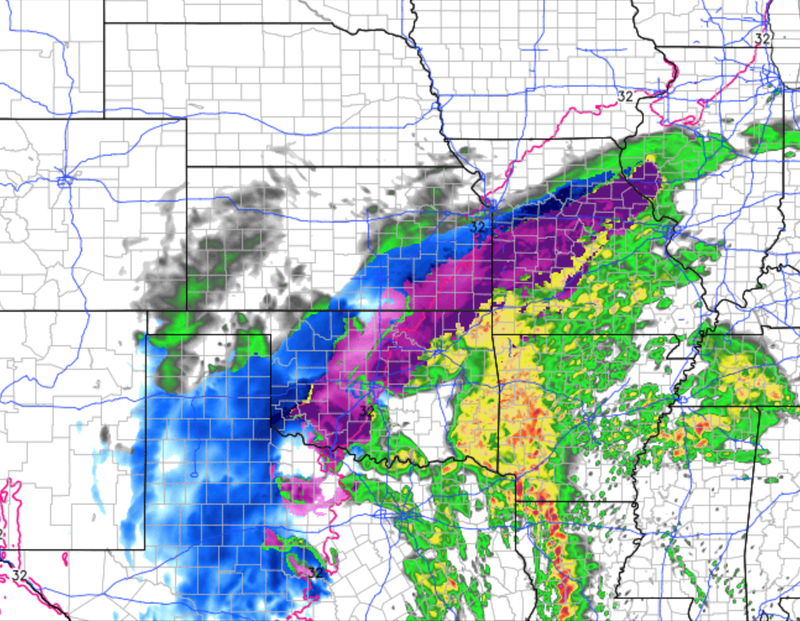 Tomorrow, I would advice against traveling on anything but major roads (i.e., I-40, I-49) if you are not familiar with the area. Sunday night, stay off the roads altogether as flooding will become widespread during the darkness. I hope the map isn't too difficult to read but I want to convey a lot of information. Click to enlarge. 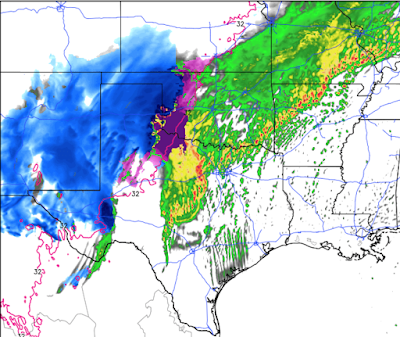 There will be a blizzard from the Oklahoma Panhandle through west Texas and eastern New Mexico. While most areas will have 8 to 20", it would not surprise me if some spots receive more than two feet. 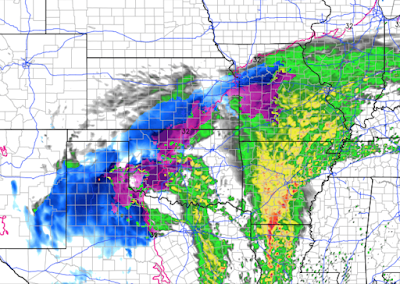 Blizzard or near-blizzard conditions will spread into southern Kansas. 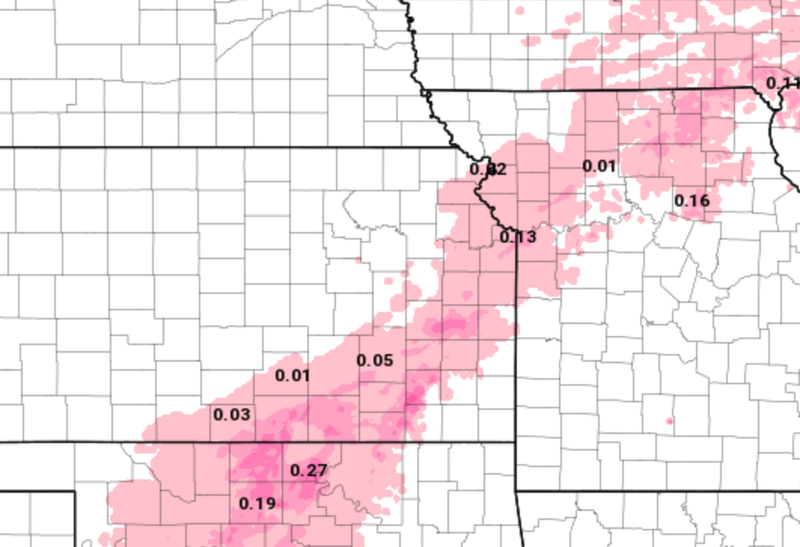 There is now a risk of freezing rain and glaze ice accumulation in the hatched areas. The darker and closer the hatching the higher the risk. The thin black lines indicate the spread of winter precipitation (snow or ice). 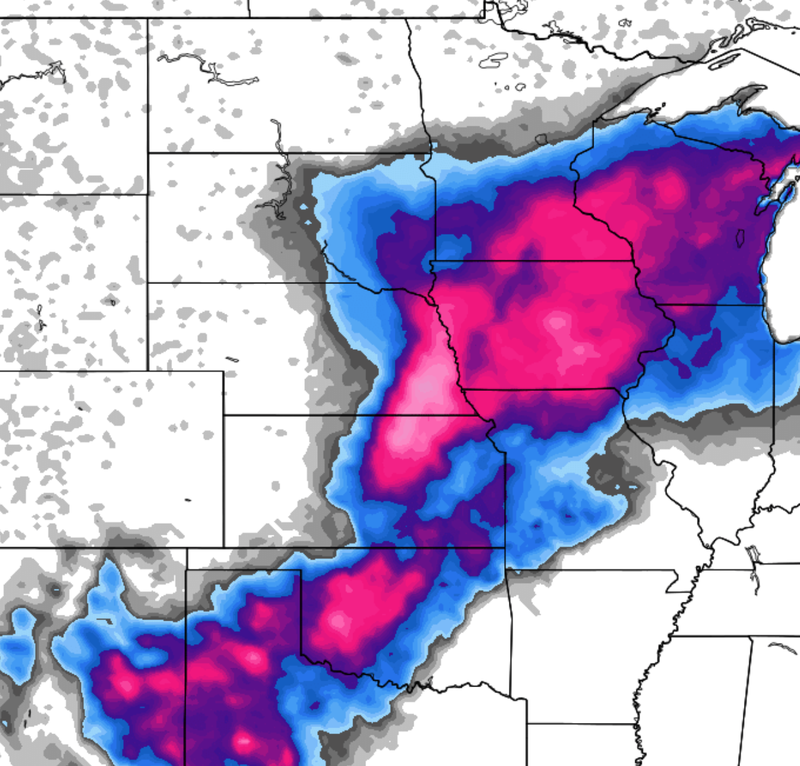 By Sunday afternoon and Monday, the heavy snow will have spread into Iowa. 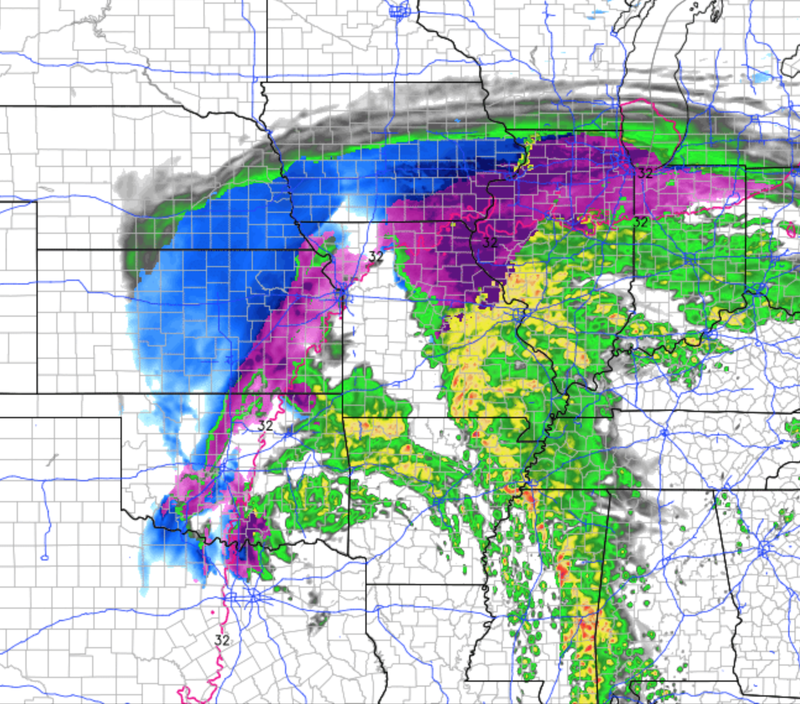 I urge you to check your local AccuWeather Forecast tomorrow morning for specific updates for your location. Just enter your Zip Code at the top of the page at the orange link. 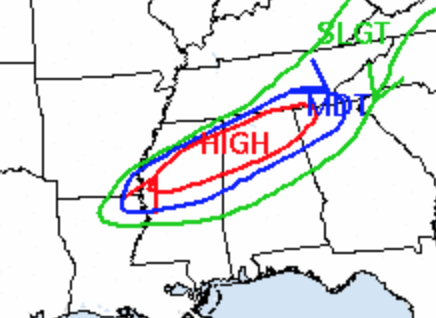 Note: Scroll down for the weekend and early week flood risk and for the Saturday tornado risk area. 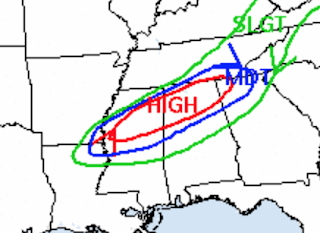 There is also a risk of tornadoes on Sunday which I will cover tomorrow. Addition: NWS in ABQ says: "HISTORIC WINTER STORM TO IMPACT..WITH BLIZZARD CONDITIONS ACROSS EASTERN NEW MEXICO.."